It’s harvest time in Yunquera! The sound of tree shakers reverberates throughout the campo, and you see men setting the nets, or preparing a campo lunch, everywhere. As you drive by the cooperative, you see canastas full of olives, ready to be pressed. It’s a comforting sight – money in the pocket in time for Christmas (if you sell your olives), and your family’s olive oil barrel full of delicious golden oil for the coming year. When we first moved here in 2003, the mills wouldn’t even be open yet. Why? Well, it was customary here to pick olives when they were all black, which sometimes would be as late as February. This made for olive oil that was golden yellow, and very smooth and soft tasting – the taste that was preferred in Yunquera. We were thought odd, as we would pick the first half of our crop in mid-December, then the second half after the New Year. We preferred an oil that was fresher and slightly greener in taste, so picked when our olives were half green/half black. This year we have noticed a huge change. Our olives are picked and pressed already – the entire crop picked in November, the earliest ever! I’ve seen loads of farmers doing the same, and the canastas at the mill are full of (mostly green) olives. Why the change, we wonder? Is the price for olives better this year, so farmers are picking early to get the best price? Is it that farmers here have finally recognised that those buying their oil now prefer a ‘grassier’, greener oil? Is it that local tastes have changed in line with this global preference? I don’t know, but to me, it shows that even in a remote village like Yunquera tastes and customs regularly change ! Categories: Crops, Olive tree work and harvesting, Pontificating, Yunquera Gold olive oil | Tags: agriculture, Andalucia, olive harvest, olive oil, Yunquera, Yunquera Gold olive oil | Permalink. Olive harvest looms, bring on the kumla! We walked the land on Sunday, to check out the state of the olive harvest. If this year’s crop goes according to custom, you get a year “on” and a year “off”, and this should be the off year. Sure enough, the crop is much smaller than last year, in which we had a bumper harvest. We certainly believe we have enough for a press, but not much more than that. That’s ok, though, because that makes life more interesting – never knowing for sure what’s there, until the very last minute! In fact, even now we can’t be sure of the crop, because if these strong winds continue, then the riper olives are blown off the tree. Not to mention the fact that you can’t lay the nets under the tree in high winds! It will just be the two of us again this year, as the crop size doesn’t warrant hiring help. That is both good and bad. It saves us money, and it’s a great feeling of accomplishment when the work is done. But man, oh man, is it hard work! Hopefully both dogs will be up to helping, as usual – but with Fitz still battling lymphoma, he may not have the energy to tromp around the hills all day. I guess this means I better get busy planning those high-calorie meals that you need to keep working all day. I usually cook ahead for the week, as at the end of the day we are way too tired to cook! So the hearty foods come into their own now – chilli, stew, and my own personal favourite from my childhood, kumla. That will really make my brother jealous! 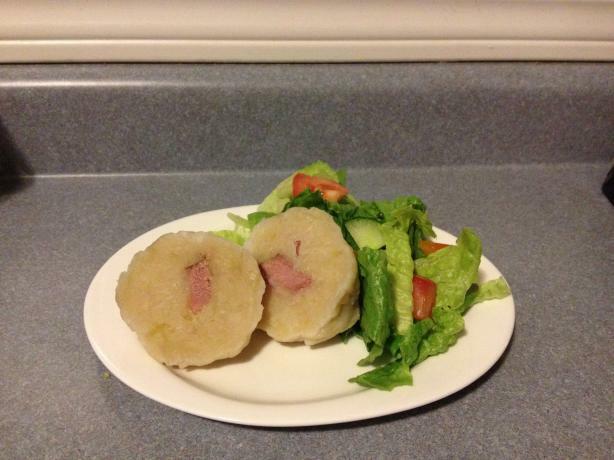 The photo shown is not my own kumla, but taken from food.com. Note that the vegetables on the plate would not ever be on the Swedish table – salad in winter? I don’t think so! Categories: Crops, Family, Olive tree work and harvesting | Tags: kumla, olive harvest, olive oil, Yunquera Gold olive oil | Permalink. The butternut squash we grow at Casa Tyr is very popular. We give it to friends, we eat it ourselves, we freeze it. 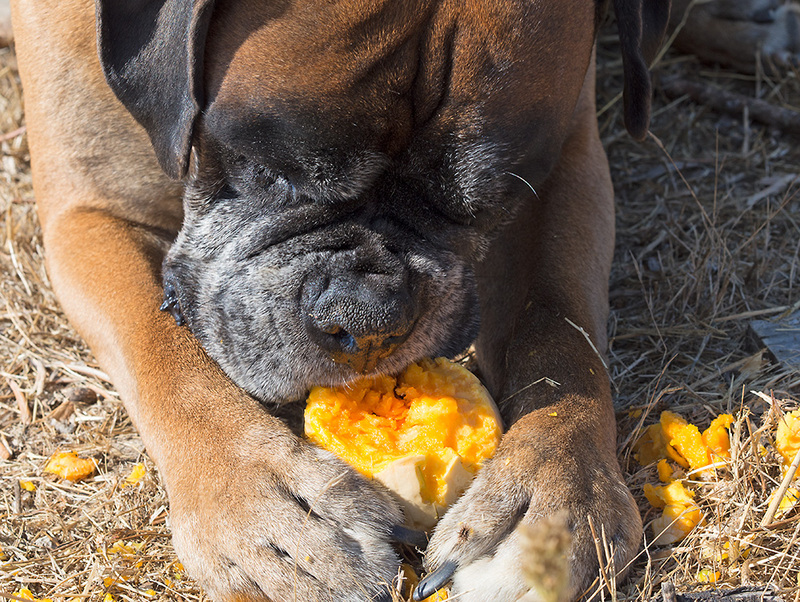 A surprising fan of our squash is our boxer dog Fitz. Well, actually both dogs really like it, but today Fitz decided to harvest a squash for himself. So he grabbed a squash off the table and ran under one of the olive trees. Believe it or not, he actually ate the whole squash, raw! I think he’s telling me it’s time to cook a squash for them, to add to their dinner. It’s good for them, so why not? I may not make the recipe shown below, but for dogs, simple is usually best. Peel and de-seed the squash. Cut into thin fingers. Fry in the olive oil with the garlic and sage until tender, and serve. 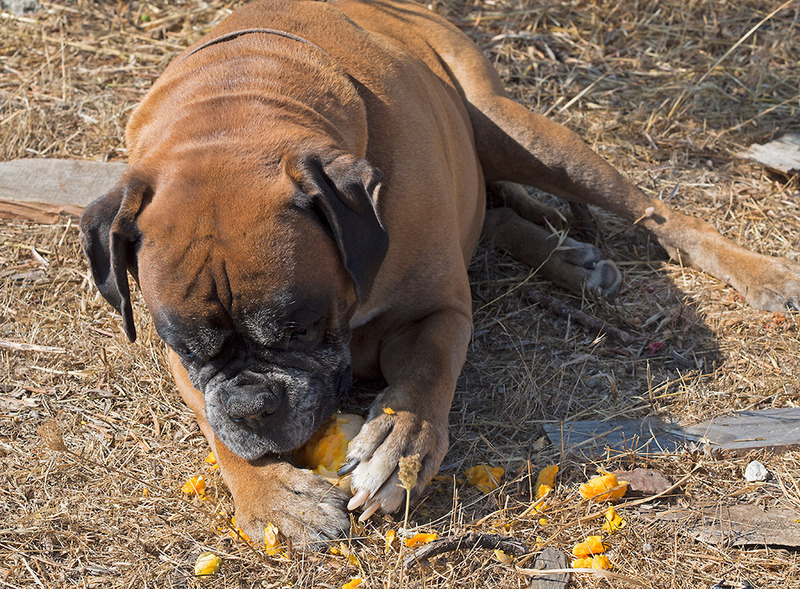 Categories: Boxer dogs, Crops, Recipes | Tags: butternutsquash, Fruit and Vegetable, olive oil, Yunquera Gold olive oil | Permalink. I’ll switch from my recent saga of Fitz’ cancer treatment to talk about our other dog, Milo. Milo arrived in our lives the year that everything went wrong – my mother and aunt died, Kenton’s father and aunt died, and as a last kick in the gut, our dog Jake died. We thought we couldn’t get any lower, and in fact, we thought life would never look sunny again. Then along came Milo, full of sunny cheer and bossiness, and life began to look up. Milo as a pup, already sassing Max! He’s a huge personality, not full of sweetness like Fitz, but demanding and (still) bossy. He knows what he wants and won’t stop til he gets it, unlike Fitz, who is pretty happy with life as it comes. So when we found that lump on his testicle, we feared the worst. It was confirmed last night – the biopsy confirmed a mast cell tumour, which are always malignant. Ok, so that’s bad news. The good part is that the lab results showed that when Ana removed it, she got it all, with clean tissue showing around all sides of the tumour. She doesn’t think further treatment (i.e. chemo) will be needed. So that’s good – although these tumours can recur, and can become systemic, but we won’t worry about that right now. And believe it or not, we do have other things going on in our lives besides dog problems and worries, although sometimes it’s hard to remember that! We are (finally, finally) starting to get ripe tomatoes, and just had our first sweet corn. Bright spots like those are very welcome right now! Cook on low heat in large sauce pan until very thick and rich, this usually takes about 5-6 hours. Homemade tomato puree, rich and dark! While hot, spoon into hot jars. Pour olive oil on carefully to just cover; cover tightly. 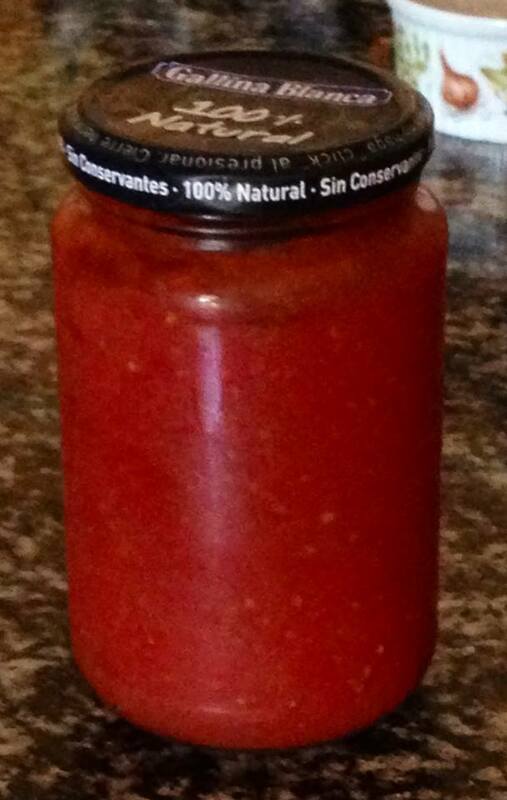 As the jars cool, they should seal – you will hear the ‘pop’ if they seal correctly. Store in refrigerator; my puree lasts up to 1 year. 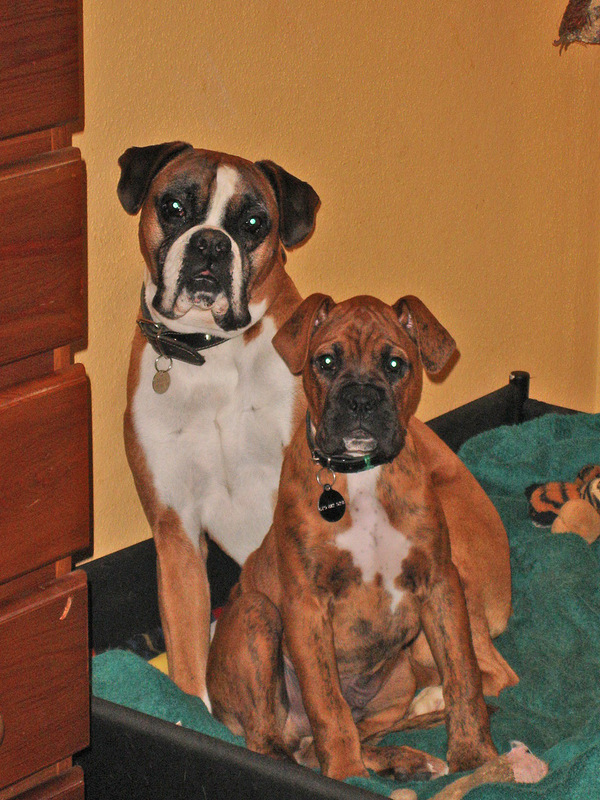 Categories: Boxer dogs, Pontificating, Recipes | Tags: olive oil, Recipes, Tomato | Permalink. Now that it seems summer is finally here, we are all complaining about the heat! Well, at least when I’m either working in the garden or shopping in the village, where I can’t benefit from that lovely Casa Tyr breeze. On a hot day like this, when we’ve also been super busy, we don’t have the time or inclination to cook a complex meal. We’re after something tasty and nutritious, that can be prepared in minutes. Oh, and preferably eaten at room temperature. 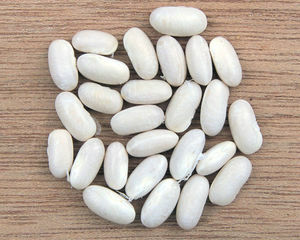 Tonight’s selection is white beans cooked with onion, garlic, sage and jamon, drizzled with olive oil and left to cool. We’ll have that with lightning squash fresh picked from the garden. Heat the oil, and cook the garlic and onion until soft but not brown. Add the jamon, beans and sage; heat through. Cool, and drizzle more olive oil over the beans at serving time. Categories: Daily life, Family, Pontificating, Recipes | Tags: olive oil, Phaseolus vulgaris, Recipes for summer, Yunquera Gold olive oil, Yunquera recipes | Permalink. This is my favourite t-shirt slogan at the mo. It can apply to so many things, just one of them today’s blog! It’s a hideous day on the mountain – misty and raining. Hard rain, the kind where you get soaked just walking to the car. We have things to do today, sure, and we have to go outside to do them – but for now, we are huddled in front of the gas fire, Kenton indulging in some idle web browsing, and me blogging! It is what it is. On the one nice day of the week, we had visitors at Casa Tyr. They had a nice wander around the land, we talked about renewable energy, food, olive oil and Lujos, and we even had an olive oil tasting session. We tasted 3 types – our “private reserve” olive oil from last year, our new oil, and one very expensive one from California. For dipping, my freshly-made focaccia. I was pleased to learn that our Yunquera Gold stacked up well against the expensive US oil, and (to me anyway) was even better, in fact! I felt it was something I knew already, but it was nice to have it confirmed. We also took the visitors to see Miguel the Iberico pork producer (soooo knowledgeable and friendly) and to visit our great friend Manuel at his bodega. Manuel loves to show off his bodega, and is quite famous for his knowledge of grapes and wine-making. 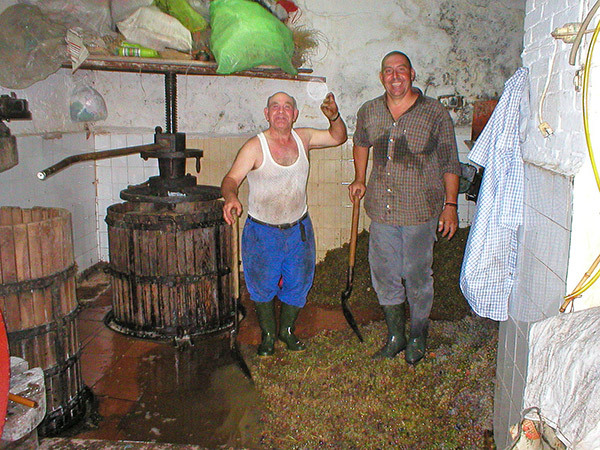 Manuel has a couple of extremely old wine presses – even he doesn’t know how old they are, but they must be at least 100 years old. He stood to one side, watching Kenton explain the pressing technique. Manuel and I had a good laugh once or twice. He loved to talk to our visitors, despite the language barrier. At one point, a visitor was speaking to Manuel in French while Manuel answered in Spanish. They seemed to understand each other somehow! Manuel looked at me “there is no honey or apple in there, just wine”, says he. Then grins. Anna knows all the recipes it goes with, just ask her! ..referring to the fact that I have written down all his campo recipes. As we leave, I comment that one glass is good, two can be dangerous, but Manuel says 2 glasses will make you dance, so how bad can that be? Pour enough olive oil into the bottom of a heavy frying pan to cover. Add sliced potatoes and garlic – cook until slightly soft. Add onions and cook until the potatoes are cooked. Break eggs into a bowl and mix with a fork. Pour the eggs over the top of the onion mixture, and turn a couple of times until the eggs are cooked. Add salt to taste. Categories: Crops, Family, Lujos, Manuel Lopez, Pontificating, Recipes | Tags: Andalucia recipes, California, Ibericos Yunquera, Manuel, olive oil, Recipes, Yunquera Gold olive oil | Permalink. I have the life I’ve chosen myself, I work for myself, I have a lovely home and family. And I’m honest enough to admit that I have one of the rarest commodities in the world – a good marriage! Good marriages don’t just happen, I’ve found. It’s a matter of choosing a simpatico person, who allows you to grow and change, and wants you to allow him the same leeway. It’s about finding someone who is not just like you, but has complementary traits, is the yin to your yang. I found just that someone, and I believe most of the time he feels the same. We both work hard at our marriage – like other things in life, nothing comes for free. All that is an aside, as I’m really here to talk about his cooking. My husband has always enjoyed dabbling in the kitchen, but since we moved to Spain, he has finally had the time to let his creative side soar. Lucky old me, I get to reap the benefits! I cook too, of course, but I’m what I’d call a good, old-fashioned cook, handy with everyday dishes and a dab hand at making bread. Creativity with food is not my thing. So let’s talk about Sunday night. We had bought some pork fillet (aka solomillo de cerdo) and didn’t quite know what to do with it. How shall we cook it, asks Kenton. (he knows I will reach for a cookbook!) He had other ideas, and in fact came up with a divine recipe that, if you can find the right ingredients, you’ll love, too. Trim fat from the outside of the solomillo. Make a cut lengthwise along the meat all the way through, leaving about 1/2 inch of meat uncut (you want to be able to open the meat into one flat piece). Open out the solomillo, cover with a piece of cling film, and gently flatten to 1/2 inch thick with a meat hammer. Season with salt and pepper, and spread the sage and garlic over the whole surface of the flattened solomillo. Cut the Halloumi into slices about 1/4 inch thick, and layer along one side of the meat, overlapping if necessary. Fold the meat over the top of the cheese, pressing the edges to cover the cheese. Wrap the solomillo roll with overlapping slices of the Jamon. Heat a frying pan to high heat, add 1 T oil and brown the pork all over, carefully turning it so that it doesn’t fall apart. Put the pork into a roasting dish, along with a little bit of olive oil, place in a preheated oven (gas mark 7). Roast for 20 minutes. Turn oven down to gas mark 4, then finish roasting until the pork is done to your liking, probably another 20 minutes. Remove from oven, and leave to rest. Using the same frying pan, add 1 T olive oil, and put on medium heat. Soften the sliced mushrooms in the oil, then add the wine. Lower the heat and simmer until the wine is reduced by 1/3. Add the honey and butter, continue to heat and stir until the sauce is thickened. 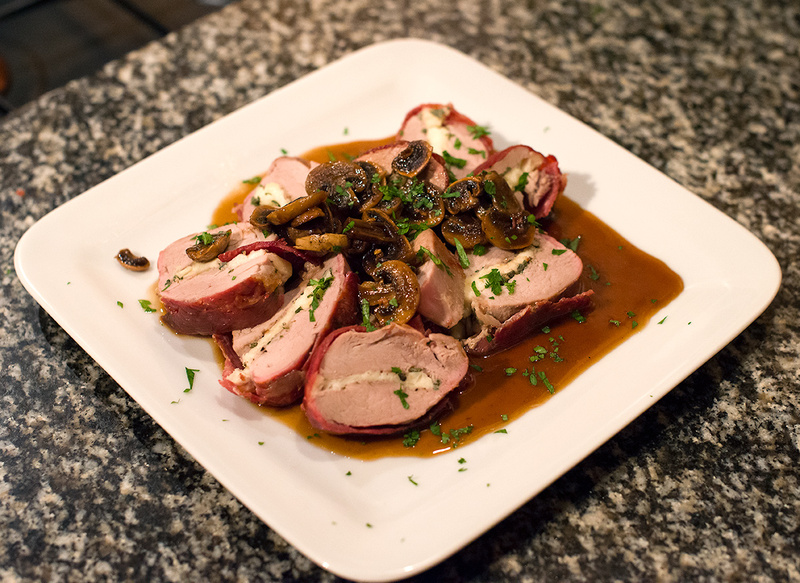 To serve, slice the pork into slices approximately 3/8 inch thick; arrange on a serving plate, then pour over the mushroom and wine sauce. Garnish with parsley and serve. Categories: Pontificating, Recipes | Tags: Halloumi, olive oil, pork recipes, Recipe, solomillo de cerdo, Yunquera Gold olive oil | Permalink.